A set of Universal Device Pollers is available to poll data from WTI’s Switched PDU Outlet Meters. These pollers can be imported into SolarWinds Orion NPM and associated with a device in your environment to monitor current usage, power usage, voltage, and other data. Use the following procedure to import a Universal Device Poller. Download the custom pollers to get started! Click Start > All Programs > SolarWinds Orion > Universal Device Poller. 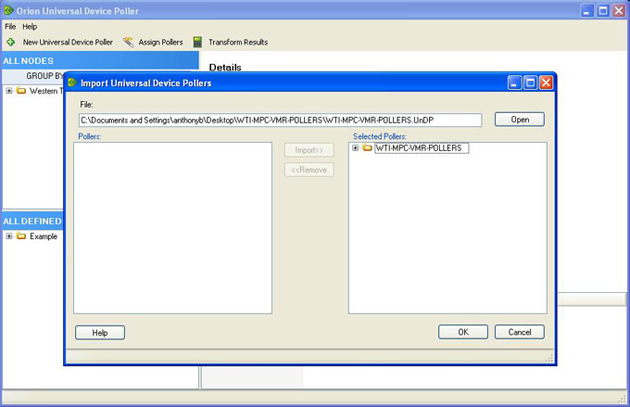 Click File > Import Universal Device Pollers. Click Open, and then navigate to the location of the WTI-MPC-VMR-POLLERS.UnDP. Select WTI-MPC-VMR-POLLERS.UnDP, and then click Open. Select the pollers to import from the list on the left, and then click Import. If you want to remove a selected poller from the list of pollers to import, click the poller to remove, and then click Remove. To select multiple pollers, use [Shift]+[click] and [Ctrl]+[click]. To collapse all folders and see just the group names, [Shift]+[click] the - (dash character) next to any of the group names. Right-click the name of the poller you want to duplicate, and then select Duplicate Poller. Modify the last digit of the OID to be the index of the attribute you want to poll. Use index 1-N for plugCurrent/plugPower where N is the number of plugs on the unit. Use index 1-54 for plugGroupCurrent/plugGroupPower (Index associated with each group can be found on the PDU plug group status page). Use 1-4 for environmentUnitXXXX where 1=LOCAL, 2=AUX1, 3=AUX2, and 4=AUX3. Modify the Name and Description to reflect the entity being polled. Click Next to choose display options. Select your new, imported poller in the All Defined Pollers pane on the left of the Orion Universal Device Poller window. Confirm that Enabled is selected as the poller Status. Select Disabled as the poller Status. Note: If Disabled, the poller will not collect data until you enable the poller. Monitoring MIBs with Universal Device Pollers. Assign nodes or interfaces to the imported pollers. For more information, see “Assigning Pollers to Nodes or Interfaces” on page 199 of the Orion NPM Administrator Guide. As soon as the imported pollers have been enabled and assigned to appropriate network devices, the pollers will begin collecting statistics. 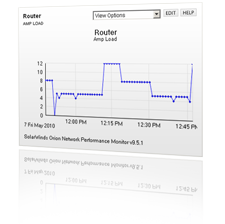 To view these statistics, log in to the Orion Network Performance Monitor Web Console and browse to a node or interface that was just assigned to the pollers. For more information, see “Viewing Universal Device Poller Statistics” on page 208 of the Orion NPM Administrator Guide.